by Dr. James Benedict Brown is the title of new book from RIBA Publishing and also the title of a conference paper given at ARCLIB, the Architecture Librarians’ Conference in July. James, essentially whet our appetite with this visually engaging introduction to his latest publication. An architect by profession, he shared the burden of his inability to engage with the built environment in any way but critically; noticing the smallest detail of a cornice, a pillar, how people navigate spaces in restaurants and so on. He has even taken this to spotting things in spaces mediated by television. Questioning, “Why is it like that?” has culminated in this book. He began his presentation by sharing how the spaces in our homes have adapted to our television viewing habits: the living room centred around the television, originally hidden in the oak cabinet, now the huge flat screen attempting to blend in to the decor. James drew our attention to the power shift between television and computer and the all encompassing device it has now become. A reminder that the Open University, first brought learning into the home through the medium of television. Then, moving on to the spaces within the programmes we watch, he made us aware of the theme of domesticity and how we like to see ourselves through soap operas. He had begun to introduce one of the themes of the book, examining the intersections of architecture created by broadcast media, a kind of hybrid version of a real/imagined world, for example, sets reflecting our significant cultural heritage; the pub in our street – something we can all relate to, yet is rarely experienced now. 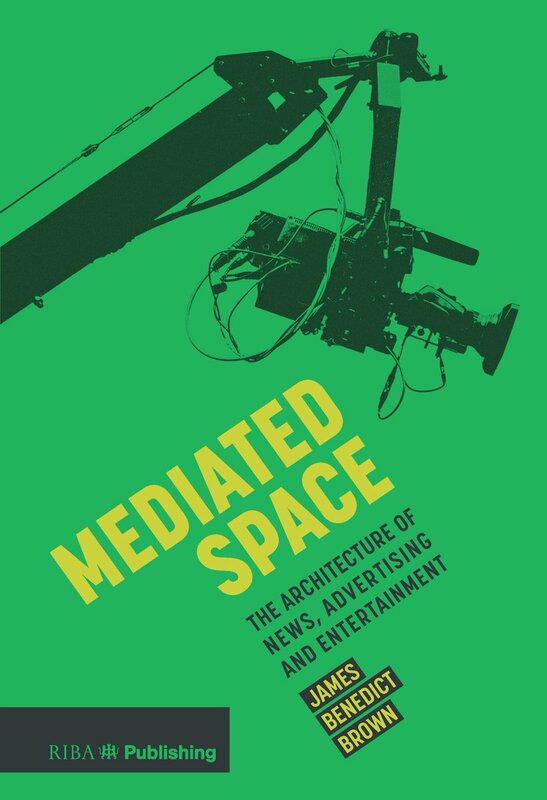 Examining the architecture of television news, he draws our attention to the media colluding to create spaces that assert a particular message or power structure. The news broadcasts with the busy offices behind, suggesting a team of committed researchers and reporters working behind the scenes – you can trust us! Orignally introduced by CNN and copied by Norman Foster’s home of ITN, this ‘set’ was subsequently abandoned for a ‘green screen’ a virtual reality space, easily updated. Similarly for the football reporting studios, where camera’s pan around to seemingly look over the football pitch; its a construct. And so the architects have been written out of the broadcast space and replaced by virtual/augmented reality programmers. Finally, James focussed on the architectural landmarks of television production including a little of its history such as old theatre spaces, including Glasgow’s Theatre Royal, re-inhabited as the home of the first independent TV channel. Familiar spaces such as Terry Farrells’s TV Am building (now MTV), Good Morning Britain’s famous view over London – a construction because the real one often looked dreary! and BBC’s One Show which does not really have the pavement outside – they are all representations of how the organisations want to be seen. I guess we know that television spaces are this kind of mixed reality but how conscious should we be of these media constructs? Its all part of our visual literacy – our awareness of being critical with the environments around us. James’s presentation has certainly whet my appetite. I look forward to reading more now that we have the book in the library.